Networking For School (N4S) was implemented in 2017. N4S complements the school’s efforts to provide our students with holistic education, character development and values inculcation. Every Parent/Guardian whose child is currently a student of FHPS is a member of the N4S Community. The N4S Community provides a platform for Parents/Guardians to volunteer and serve in various N4S Subcommittees and/or events subgroups. Since its inauguration, N4S has assisted as parent volunteers (PVs) in many school activities such as Youth for Environment Day and EL Week (Reading Under the Stars, Character Dress-Up Day, Read Aloud session). N4S had also pioneered the JnrGEM initiative in which existing PVs lend assistance to incoming P1 parents through class chat groups. This class chat network was also extended to other classes via the ConnectGEM initiative. Photo 1: Parent Volunteers (PVs) and their children hard at work with making YED material. Photo 2: Our active PVs – Ka Po and Lia! Photo 3: Daddy and Mummies PVs helping with the Reading Under the Stars set-up. Photo 4: Daddy and Mummies PVs helping with the Reading Under the Stars set-up. Photo 5: PVs and child all decked up in their favorite book character home-made outfits for Book Character Day. Photo 6: Book Character Day – PV as the Kind Witch from the book “Witch on a Broom”. The N4S Community is managed by the N4S EXCO who's Chairperson and members are currently N4S Parents/Guardians. We welcome parents to volunteer your expertise and experience to the holistic education of our students under the N4S Community. You can volunteer by contacting our school at 65624370 or n4s@fuhua.edu.sg. Please indicate if you would like to join our N4S Parent Volunteer Chat Groups. Fuhua PSG members were the role models for all our parents through their involvement in the school programmes and events. Their exemplary work with the teachers and staff of the school sent a strong signal to the all our pupils that parents were valued partners in their education and thereby leading to stronger bonds forged within the family. The N4S will continue to carry the tradition, ethos and values of the PSG. 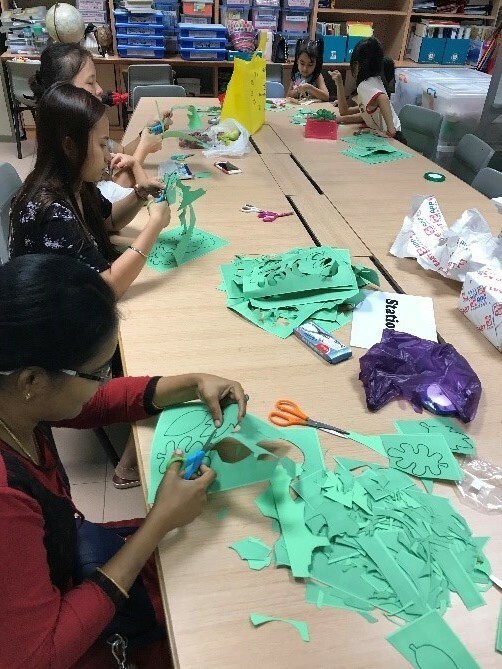 Staff, parents and pupils participated in the event to attempt to break the Singapore Book of Records of the Largest Garden Made of Recycled Materials. This is a collaboration with SouthWest CDC and Dairy Farm Singapore, held on the 21st of July 2013, at Jurong East. The Fuhua PSG, supported by the School Family Education, organised a "Parent-Child Bonding Thru Roller Blading" workshop on 2 Mar 12. The response was excellent with 90 pairs of parent & child participants and everyone had a wonderful time of fun and bonding. It was amazing that after the three-hour workshop, many could skate confidently. Good feedback from parents, they were surprised that they could learn to skate within the short few hours and many expressed their appreciations that they have forged a better bond with their child through learning to blade together. Exercising is a fabulous start to the day. And learning as a family, irrespective of age, is an eye-opener for all!